Memorial program, in many parts of the country, is also known as funeral service program or funeral program. It is the last rites events AKA funeral gathering event of a deceased person. The program or the event is call upon by the members of family, and the attendees are the friends, relatives, and other near and dear ones of the person, who has departed to the God’s world. What Is Memorial Program Template? Memorial card templates are already-designed cards or samples that give you an idea – how the completed card will look like? They are simple and elegant in design, as they carry the bad news about the death of someone. These cards are sent to people, close to a person, who has died, because of the course of nature. This memorial card delivers the same message. People commonly opt for memorial program templates that are present in their Microsoft Word or any document-making program, to compose memorial event invitation cards. But these free to use templates are so widespread, and thousands of people across the globe have made use of them. Optionally, many people choose to visit their nearby card shop to decide on a suitable memorial event card for inviting the attendees of the funeral program. Though, buying cards from the card shop, and getting it printed at a nearby printing press, and sendig cards as invitation to invite guests for an event is the traditional approach, but things have changed now. Nobody wants to visit shops and waste his precious time in wandering from one shop to another. They want something that can be done instantaneously, in a few blinks of moments. Nowadays, purchasing stuffs and necessary household from an online shop over the internet has become the hottest trend. The same trend has surfaced as a great option to buy, as it saves money, time and resources, like fuel, which burns every time you visit your nearby shop. It is primarily because of the expediency it offers. It is simple, it is easy, and it does not take a hefty amount of your time. There are many websites and places on the internet where you find unique and decent looking memorial card templates. Some of these websites are well equipped design houses that have lined in the best graphic designers, available in the market. No one but a dexterous graphic designer can design memorial program template affluently. Less time taking – The current generation seem to have achieved everything, but time. People nowadays try finding ways that take less amount of time. Therefore, they consider buying from an online store rather than visiting and bargaining at a local store. Online portals and websites display high resolution images of their available memorial program template. It enables people to select their desired card, which they find attractive. Some sites have developed such applications that let visitors view their products in 360 degree view. It all helps people cull out their desired products straight away, without wasting much of their time. Additionally, the best part of buying memorial program card online is that you can buy them at any point of day or night; they are open twenty four hours a day. Originality – The templates that are available on Microsoft Word are not unique. They have optimized thousands of times worldwide. Therefore, many people are irked when it comes to use free templates. On the other hand, the cards that are sold online, are fresh and unique, and have never been used before. Using original cards give the best and proud feeling. 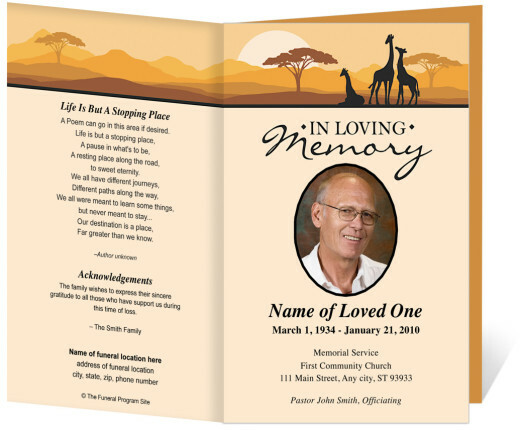 A majority of people now prefer buying memorial program template, before optimizing them into invitation cards for the memorial or funeral event. Additionally, original cards mark the best and long lasting impression. 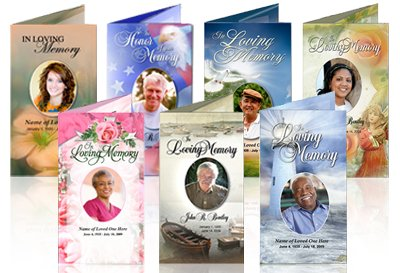 Appealing Memorial Program Template – The templates that these online websites sell are designed and composed by professional graphic designers. They are well aware that how and what should the nature of a funeral or memorial program card. They design the templates keeping all the basic principles of such event in mind. Their principal goal is deliver the best looking, elegant and impressive memorial program template.